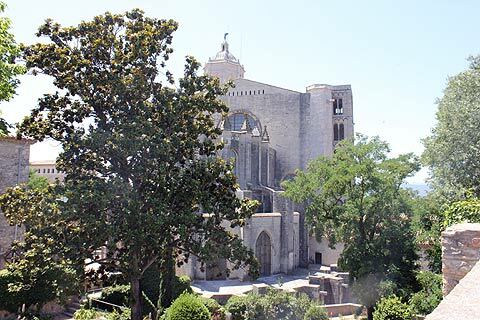 Girona is capital of the province of Girona in the region of Catalonia. Girona is a beautiful walled city which sits on the edge of the River Onyar. On the waters edge are lovely tall buildings painted in a range of colours on the yellow/ochre end of the spectrum. Up above the river in the old town Girona's historic past is evident in its beautiful buildings. Girona was an Arab town for over 200 years and nowhere is this more apparent then in the clusters of narrow streets in the centre. Architectural styles range from the Roman ramparts which are now an Archaeological Walk (the Passeig Arqueologic) running around the old town, to the narrow cobbled streets of the old Jewish quarter to modernista buildings scattered throughout. Girona's historic centre is fairly compact and easy to see in a day though it would be a good place to come for a weekend break and enjoy its sights at a leisurely pace. In order to see all the main sights head first for the Tourist Information Office which is close to Placa Catalunya. Here you can pick up a map of the centre with all the main sights clearly shown. Place Catalunya is easy to find as it is a kind of island on the river so if you find the river you will be able to see it from one of the bridges. In Girona the historic old part of town is on the east side of the river and the newer town and main shopping streets are on the west side. Whilst you will undoubtedly spend most of your time in the historic old town Girona's newer town is also very attractive and has excellent shops and boutiques. 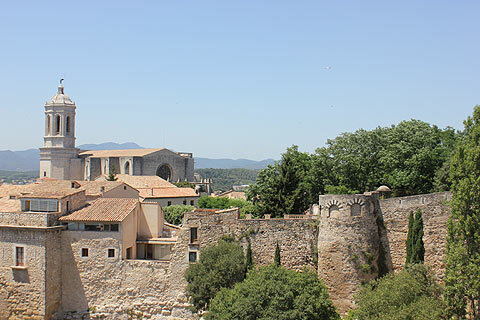 Girona is one of Spains richest provinces and Girona is a shopping treat. The Rambla de la Llibertat is one of the main streets and is a lively street packed with cafes and bars and especially entertaining on an evening when the town comes out for its evening promenade. From the tourist office cross the river and start walking down the Ramble de la Libertat and stop at each of the bridges to enjoy the much photographed colourful buildings that line the river. The best view can be seen from the first bridge you come to - the Pont de Pedra. Notice the red metal bridge, this was designed by M Eiffel a couple of years before he built the Eiffel Tower. 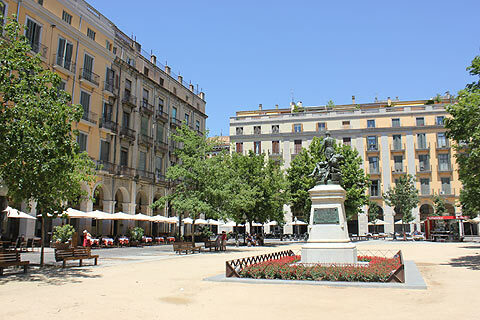 Continue along the Rambla and you arrive at the Placa dels Apostles and the cathedral. 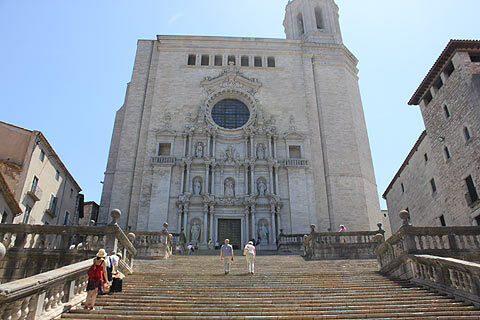 The cathedral in Girona is a mix of Catalan Baroque - on the west face and in its fabulous 17th century steps - and Gothic. The steps are a popular meeting place and with the cathedral at the top and the beautiful medieval buildings along the edges it's a great place to stop and enjoy the sunshine. The nave of the cathedral has the widest Gothic span in the world and is an awesome space. Sceptics said the building could not be built safely and the architect had to get special permission to go ahead! Inside the cathedral's museum is a fine collection of religious art including the famous 11-12th century Creation Tapestry. This is the best remaining piece of Romanesque textiles in the world. Inside the cathedral is also a Beatus (medieval manuscript) which has some fabulous illustrations with a distinct Mozarabic influence. There is also a 12th century cloister. There is a charge to enter the cathedral but it is worth it to see the sheer size of the nave and to admire the exceptional artworks inside. 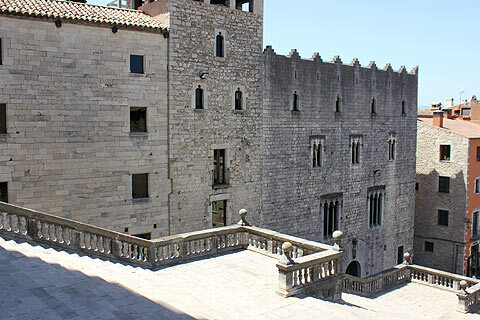 The Museu d'Art is housed in the Episcopal palace next to the cathedral and is one of the best art galleries in Catalonia. One of the highlights is the 'Book of Martyrs' from the Monastery of Poblet. You can also enjoy some of the many paintings of the view of Girona from its bridges. Sant Feliu church is down the steps from the cathedral. This is Girona's favourite church and next to its high alter are eight Roman sarcophagi embedded in the wall of the apse. In Sant Feliu square is a statue of a lioness climbing a pillar, known as El Cul de la Lleona. Popular legend has it "that you can't be a resident of Girona until you have kissed the backside of the lioness". Close by are the Banys Arabs (Arab Baths) which despite their name were built 300 years after the Arabs left! 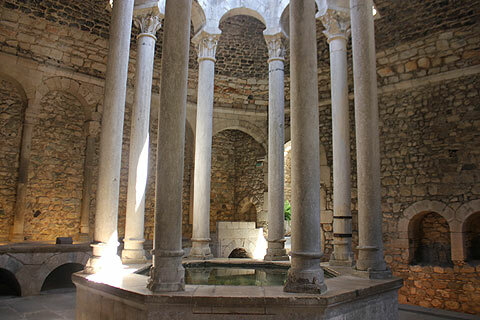 They are though in a lovely Moorish style mixing Arab and Romanesque styles and they are the second-best preserved baths in Spain after Granada. The Museu Arquelogic is housed on the bank of the River Onyar in the former church of Sant Pere de Galligans and contains many items from the Greek and Roman settlement of Empuries. It is close to the Arab Baths. The Passeig Arqueologic - the huge, fortified city walls provide an excellent way of enjoying different sights of the old town. 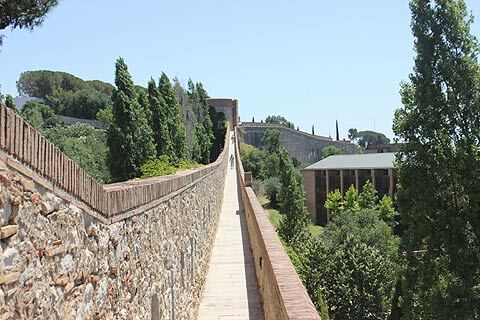 As well as the views take the steps down to the Jardins dels Alemanys where there is a shaded garden and remains of 17th century barracks where German mercenaries were housed. Climb the steps at Torre del Telegraf o del Llamp, Torre de Sant Domenec or Porta de la Reina Joana for the best views of the city. The Centre Bonastruc Ca Porta is found in the old Jewish Quarter of El Call. 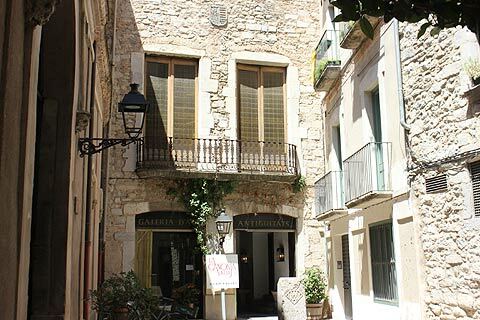 The centre gives the history of the Jews of Girona who were expelled in the late 15th century. The whole of the El Call Jewish Area is the best-preserved Jewish quarter in western Europe. It is an attractive mase of cobbled streets and narrow passageways. Jews lived in Girona since before the Moorish invasion and initially lived in the Call area under protection of the king (in return for payment). However anti-Jewish feelings rose and in 1391 a mob rose up and killed 40 Jews and forced the others to take refuge in the Torre Gironella (now ruined but visible from the Passeig Arquelogic). From then on the Call became a Jewish ghetto and the Jews were prevented from leaving this restricted area until finally in 1492 they were expelled as part of the expulsion of all Jews from Spain. The Museu d'Historia de la Ciutat is housed in an 18th century convent. Remains of the cemetery are visible including niches where the bodies of the nuns were placed while decomposing. The exhibits are an eclectic collection of items including old radios and other electrical goods. Museu del Cinema is a history of the cinema and includes a private collection belonging to a local director - Tomas Mallol. If you wish to treat yourself then go to the El Celler de Can Roca restaurant in Girona. This was voted the second-best restaurant in the world by Restaurant magazine! Otherwise one of the main eating areas is in the newer town in the Placa Independencia which is a lovely square surrounded by cafes and restaurants. 22km from Giron is the village of Pubol and the medieval castle Salvador Dali bought and decorated for his wife Gala. The castle contains lots of Dali artworks and furniture bought by the couple plus a collection of Gala's haute couture dresses. It is a fascinating glimpse into the life of Dali. 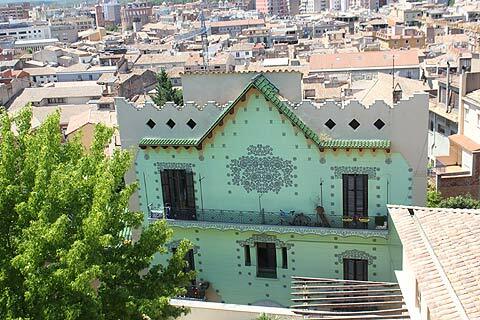 Gala is buried in the grounds and Salvador lived here until a fire broke out after which he moved to Figueres. It is also not far from one of Spain's most beautiful villages, Peratallada.